I received this product complimentary in order to facilitate this Smile Brilliant Review. As always, all content and opinions are entirely my own. 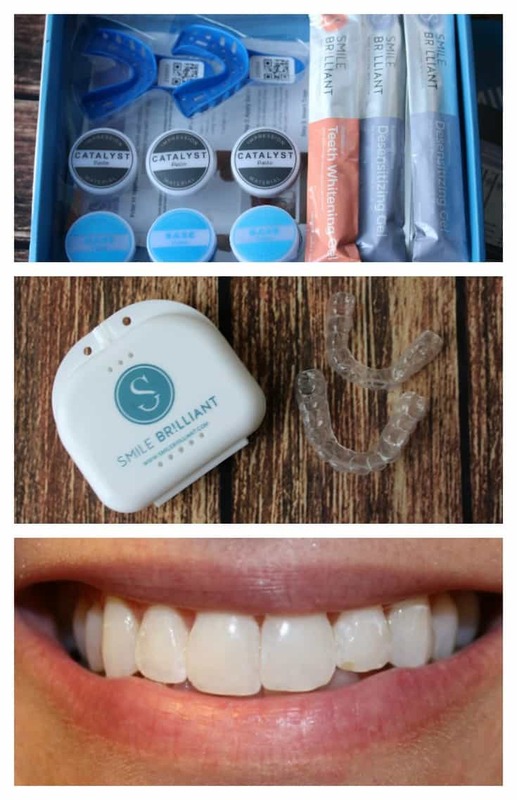 If you are considering trying an at-home teeth whitening system, this Smile Brilliant review will help you decide if this is the one for you! I will admit that I was hesitant when I was first approached to do this Smile Brilliant review. 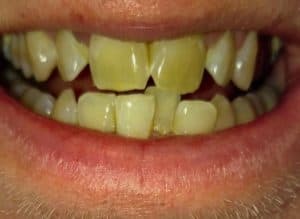 As someone who has worked in the dental field for close to 20 years I’ve seen my fair share of scams and products that just do not measure up. I decided to do a little research on my own before agreeing to try this at-home teeth whitening system. My first concern was finding out exactly what the actual whitening gel was composed of. I was happy to learn that it is a 22% carbamide peroxide gel. The gels we carried in the office that I last worked in ranged from 15% to 35%. 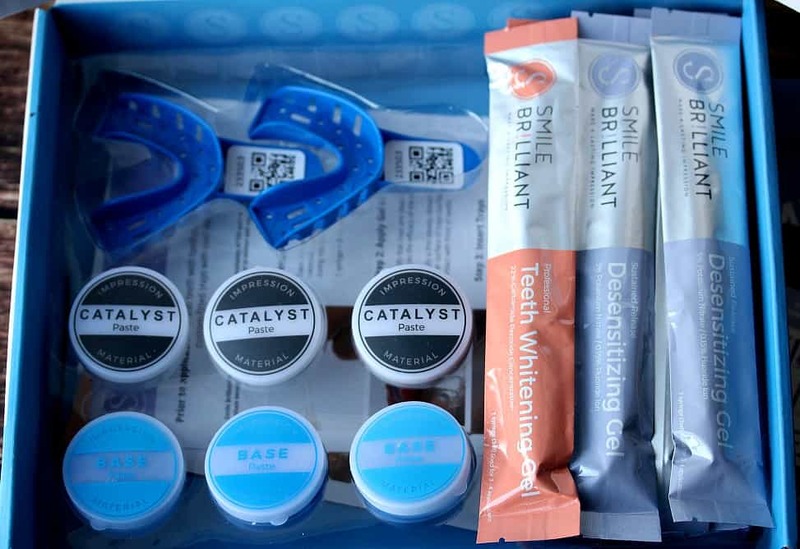 I was also concerned with how well the whitening trays would actually fit and what they would be made of. The impression material used to make the mold for the tray is very similar to the type we use in office when we need to get very accurate models with little distortion. The actual tray material appears to be exactly the same as the material we use to make whitening trays in office as well. Happy with what I had learned so far, I decided to go ahead and give Smile Brilliant a try. Because I have whitened my teeth many times over the years, I also had a friend try Smile Brilliant too! The first step is to mix the impression material and take both top and bottom impressions of your teeth, one at a time. Mail the impressions back to Smile Brilliant in the envelope provided and they will make your trays and mail them back. Once your custom trays arrive back to you, you are ready to start whitening. You will wear the trays with the whitening gel for 45 minutes up to 3 hours each time. You can follow up each whitening application with the desensitizing gel if you experience temporary tooth sensitivity while whitening (a common side effect that can last a day or two). You may need to skip a day between whitening sessions if you experience sensitivity. The amount of treatments you need to do will depend on how stained the teeth are to begin with. It’s always a good idea to take before and after photos to better track your progress. 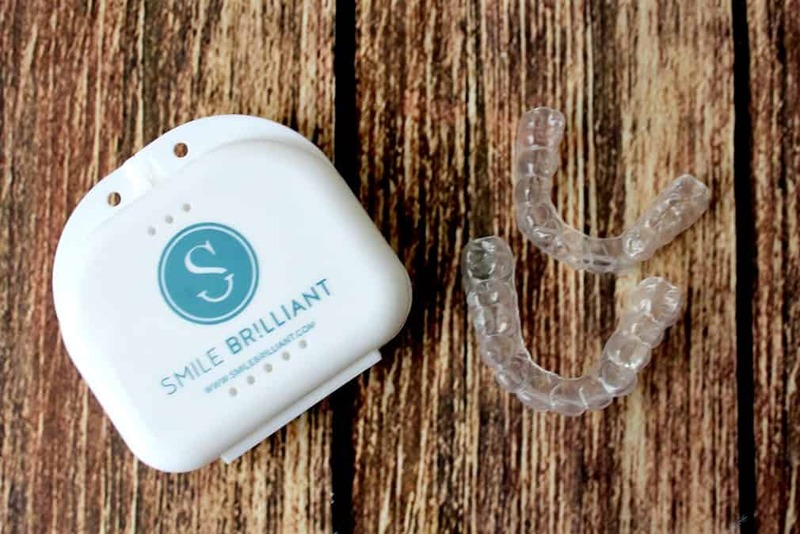 My overall experience with Smile Brilliant has been great! My trays fit perfectly and were of the same quality as the trays I had made for myself in office. One syringe of whitening gel lasted me 6 treatments. I only use it on the teeth I know are visible when I smile. The kit comes with 6 syringes so there is plenty of gel for those whose teeth are more stained, and/or for touching up later. I did experience some gum sensitivity a couple times due to me not wiping off the excess gel. I simply skipped a day in between whitening treatments to allow it to go back to normal before continuing. I have never had any tooth sensitivity due to whitening and therefore did not need the desensitizing gel treatments. Like I said before, I have whitened my teeth quite often over the years so my teeth were pretty white to begin with. These are my before and after photos taken in as close to the same lighting conditions as possible and unedited. 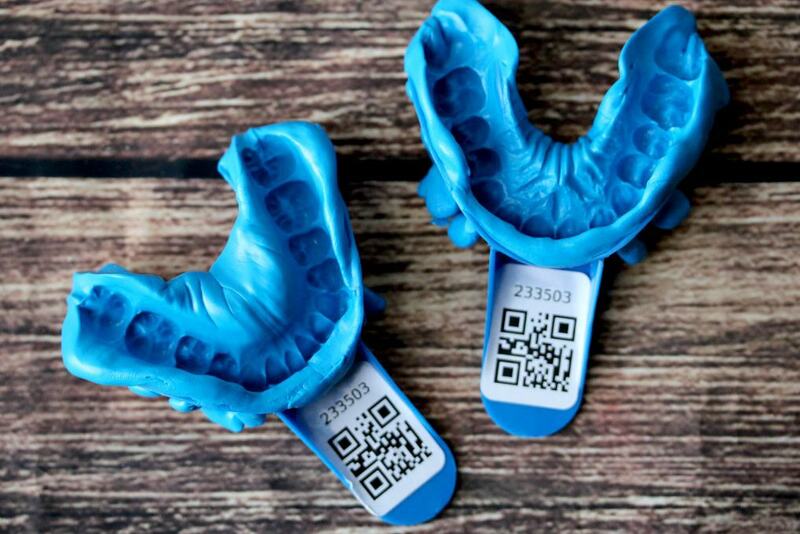 My friend had never taken impressions before and was concerned they would not be usable, but they were! He stated that his trays fit great as well! He had pretty much the same experience I did with some tissue sensitivity, but no significant tooth sensitivity. He has never whitened his teeth before. These are his before and after photos about halfway through his treatments. Would I recommend Smile Brilliant? The simple answer is yes. The quality of the trays and whitening gel is equivalent to that you would find in a professional dental office. However, the dental hygienist is me does have one recommendation before you buy a Smile Brilliant kit. Please make sure you are up-to-date on your check-ups before whitening your teeth. It’s always best to get the “all clear” before any whitening treatment! To learn more about Smile Brilliant be sure to visit their website! 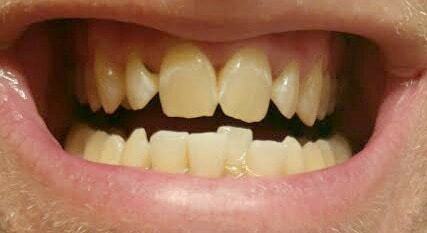 Encouraging those with sensitive teeth can get white teeth finally as well. Woot! Would love to try this teeth whitening system. My teeth are colored from medication. I don’t think you’ll be disappointed! It’s the same stuff dental offices use for their at-home whitening trays! Just wanted to stop by and thank you for letting me feature your post for my Saint Patrick’s Day Round Up. If you get a chance, hop on over so you can see which one was chosen. Thank you so much!! Loved your post!